He loves water polo. 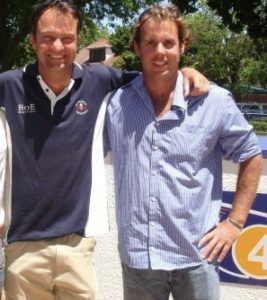 He is the Chairman of Western Province Aquatics Water Polo and the Head of Water Polo at Reddam Constantia, coaching the junior boys and senior girls. He is ‘Mr Water Polo’ and his name is Grant Mackenzie. Amanzi Mag had the pleasure of sharing a coffee with him and chatting all things water polo in South Africa. Grant played school tennis and water polo at St Stithians. Both at a competitive level until matric. 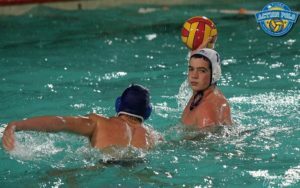 He chose to invest his passion in his first love – water polo. He played for both Gauteng and S.A. Schools. In his post-matric year he coached Saints. He subsequently joined Stellenbosch University’s 1st team and coached their ladies 1st team. And then when ‘life took over’ he started playing socially and sharing his wealth of experience with Western Province’s aspiring talents. 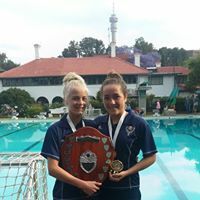 Did you know that water polo is the fastest growing sport in South Africa? “At a school level it is still competitive, as parents are still investing in their children’s games. That way we can send our best sides overseas to train and compete internationally,” comments Grant. In terms of Senior girl’s schools, Stirling have just shifted off the top of the log and St Stithians have taken their place. St Stithians remain the side to beat. Eastern Cape teams from Pearson and Stirling are however hot on their heels. Although as a layman, it seems that this is quite fluid and can change super quickly. Reddam Junior teams are on top form, recently claiming two golds and two silver medals. This bodes well for their senior school’s pipeline. “Swim SA and SA Schools are linked but separate bodies. Steve La Marque has just been elected to the SA Schools body and we hope for a positive spin-off when he officially takes over,” maintains Grant. Water polo still a predominantly white sport. This is mainly due to a lack of deep pool facilities at school level. The City of Cape Town used to fund a development programme where children were bussed to Reddam. This was very successful, however there are several pools out in Belville, affording kids the opportunity to learn to swim and play water polo closer to home. group to Serbia, the top teams in the world at all levels. Next year he plans to take a team to Italy to train at various camps. He also runs a self-funded development programmes in Khayelitsha, Hanover Park and Blue Downs – however these Aquatic Centres have pools that cannot accommodate water polo tournaments, as they are too shallow. “I travel to Zimbabwe about once a year and train some squads up there.” According to Grant, schools such as Hellenic, Chisipite and St Johns are all faring well. One of the top girls from Chisipite, Chelsea Karimazondo, has just secured a scholarship to Arizona State as a water polo goalkeeper. Watch Chelsea in action here. 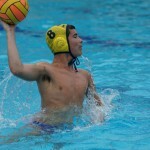 To be a top Water Polo Player? Time in the water. According to Grant this is the best advice. “You also need a decent swimming background, be able to tread water properly and have a good pair of legs.” He maintains that treading water is a life skill. Many people cannot tread water, and this accounts for so many more drownings in South Africa. It’s not an expensive sport in terms of gear required as all you need is a costume. However, if you want to play and compete in tournaments the average school child will spend about R20 000 a year on tours. • The number of girls and boys are starting to equalise at school level. • There is some steady growth along the Garden Route towns, like Knysna & Sedgefield. This trend is linked to more private schools opening in that region. • Growth in the sport is also being seen in the Northern Suburbs among the Afrikaans Schools. • An ongoing trend is the shortage of trained referees and coaches. Western Province Schools do run coaching clinics and referee courses to put more people onto the circuit. • The other limitation is the right facilities and infra-structure. You need a big deep pool. So, growth of the sport is often limited to the Southern Suburbs. Grant also owns the South African rights to Turbo swimwear catering for triathletes and water polo players. Turbo is a Spanish owned and family-run company that literally operates from a small garage in Spain and supplies globally. He recently launched the Turbo Trust Fund which aims to raise funds for players and officials to get to tournaments. This passionate sportsman is dreaming big and has a vision to build an indoor aquatic centre. “There is currently no independent indoor aquatic centre where we can practice swimming and Water Polo all year round.” Watch this space. In the immediate future he is preparing his Western Province girls U19 team for SA Schools 8 – 12th December in Port Elizabeth. Last year they came second, so they are aiming for gold this time round. 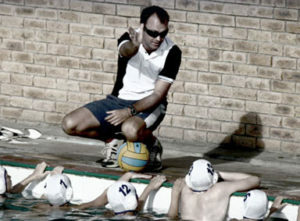 Amanzi will keep in touch with ‘Mr Water Polo’ who is a dedicated champion of the sport. We will be sure to bring you more of the latest in this rapidly growing and popular sport. Winners will be notified on the Amanzi Facebook page on Friday, 15th December.